Ruth Gomez, mother of Max Gomez. The frame was created by his kindergarten class. Photo by AP photographer Mark Humphrey. 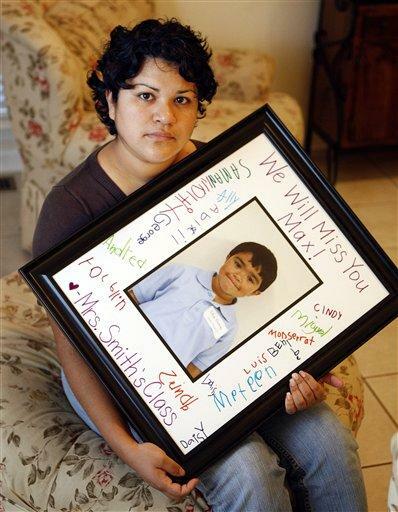 5-year-old Henry Maxwell Elementary School student Max Gomez fell ill with H1N1 on Friday and died Monday, the same day he was admitted to Vanderbilt Children's Hospital, according to the Tennessean. Even before confirming the H1N1-related death of Gomez, the Metro Nashville Public Health Department was getting out the word about the virus, in the hopes that education could prevent widespread transmission in Middle Tennessee. Multilingual communications are in process, starting with Spanish (see Spanish-language letter to school parents, students, and staff here; and Spanish-language "Cover your Cough" poster here). Other languages to be added include Arabic, Somali, and Amharic. The Metro Public Health Department received confirmation today of the death of a child as a result of H1N1 influenza. The child, a 5-year old boy from Davidson County, became ill on Friday evening and died Monday night at a hospital. Health officials are investigating whether any underlying medical conditions may have contributed to the death. “Our thoughts and prayers are with the family and friends of this child,” said Bill Paul, M.D., Director of Health of Nashville/Davidson County. "Even though most people who get H1N1 flu have a mild illness and quick recovery, this death is a sobering reminder that it can be a serious illness. We all need to pay attention and do what we can to help reduce the spread of the virus." Metro Public Health officials are receiving many reports of flu-like illness from individuals, schools, physicians, and workplaces throughout the county. Typically at this time of year flu-like illness is not common. The Health Department expects to see a continued increase in flu-like illness due to H1N1 in the coming weeks. Symptoms of H1N1 influenza have been similar to seasonal flu. This includes fever, muscle aches, and either cough, sore throat or runny nose. Headache, fatigue, vomiting, and diarrhea also may occur. Most people who are ill will recover on their own and do not require specific testing or treatment. The Centers for Disease Control and Prevention estimates 5 percent to 20 percent of the U.S. population gets seasonal flu each year. According to CDC, more than 200,000 people are hospitalized from flu-related complications and about 36,000 people die from flu-related causes each year. Parents are urged to use the same judgment about seeking medical care that they would during a typical flu season - do not seek medical care if your child is not sick or if symptoms are mild. If your child has a fever and respiratory symptoms, including cough, sore throat, runny nose or nasal congestion, please contact the child’s doctor for guidance before going to a clinic or emergency room. Young children and pregnant women are priority groups to receive H1N1 vaccine because they are at increased risk of serious complications from flu. “Even though the risks are relatively small, extra caution is important for those at higher risk,” said Dr. Paul. * Avoid close contact with people who are sick. * Cover coughs and sneezes with the crook of your elbow or a tissue. * Wash hands often with soap and water, especially after coughing or sneezing. * If water and soap are not available, use an alcohol-based hand sanitizer. * Try not to touch your eyes, nose, or mouth. * Get the seasonal flu shot, which is now becoming available locally. * Children and adults who are sick should stay home if they have symptoms of fever (over 100 degrees F) and cough, sore throat, runny nose, body aches, vomiting or diarrhea. Ill persons should not return to school or work until 24 hours after they are free of fever without the use of fever-reducing medicines. Get the H1N1 flu shot when it becomes available—currently projected for Mid October. Anyone with concerns or question about flu-like illness should call their physician. More information about H1N1 flu is available on the Metro Public Health Department's website www.health.nashville.gov or by calling the community information telephone line 615/340-7775.